Following the successful launch of the two satellites built by Orbital ATK (NYSE: OA) early this morning, more accurate tracking and characterization of man-made objects will now be possible for the US Air Force. 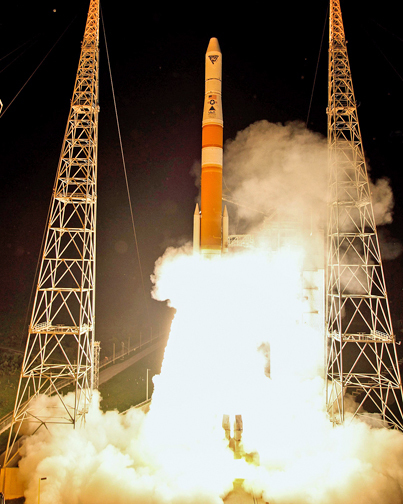 The launch was completed aboard a United Launch Alliance (ULA) Delta IV rocket from Cape Canaveral Air Force Station, Florida, and were the third and fourth for the Geosynchronous Space Situational Awareness Program (GSSAP) and comprise Air Force Space Command Mission Number Six, or AFSPC-6. In addition to the company-built satellites that were deployed, Orbital ATK also provided propulsion, key composite structures and other components on the Delta IV launch vehicle. The launch of AFSPC-6 from Space Launch Complex-37 at Cape Canaveral Air Force Station via a United Launch Alliance Delta IV rocket. Photo is courtesy of ULA. The Orbital ATK-built satellites will operate in near-geosynchronous orbit and collect Space Situational Awareness (SSA) data for more accurate tracking and characterization of man-made objects in Earth orbit. The goal of the program is to enhance the country’s knowledge of the geosynchronous orbit environment for more timely and accurate orbit predictions to improve space flight safety. The first two GSSAP satellites built by Orbital ATK were launched July 28, 2014, on AFSPC-4, which included the Air Force Research Laboratory’s Automated Navigation and Guidance Experiment for Local Space (ANGELS) satellite, deployed from the AFSPC-4, EELV Secondary Payload Adapter (ESPA). Orbital ATK was the project’s prime contractor responsible for overall system design and development. Orbital ATK designed, manufactured, integrated and tested the GSSAP satellites at their state-of-the art manufacturing facility in Dulles, Virginia. The company’s facilities in Dulles, along with Goleta and San Diego, California, and Beltsville, Maryland, provided numerous subsystems, including the satellite’s solar arrays, heat pipes, avionic boxes, flight computer, shunt regulator assembly, composite components and deployable structures. Orbital ATK also made major contributions to the Delta IV launch vehicle, including the two 60-inch diameter Graphite Epoxy Motors (GEM-60) produced at its Magna, Utah, facility, where it has manufactured 82 GEM-60s for the Delta IV launch vehicle since the initial flight in 2002. In addition, Orbital ATK supplied 11 key composite structures for the Delta IV rocket and GEM-60 motors that were manufactured at its facilities in Iuka, Mississippi and Clearfield, Utah. Additionally, Orbital ATK manufactured the propellant tank for the Delta IV upper stage roll control system at the company’s Commerce, California, facility, and designed and manufactured the nozzle for Delta IV’s RS-68A engine at its Promontory, Utah, facility. Orbital ATK also designed and produced the nozzle’s thermal protection material, which is capable of shielding the nozzle from the extreme heat of launch, when external temperatures can exceed 4,000 degrees Fahrenheit. Christopher Long, Orbital ATK’s Vice President of National Security Systems, remarked that this launch marked the deployment of the second set of satellites the company has designed and built for the US Air Force GSSAP program and are especially crucial as they will enhance space situational awareness, a top priority for Air Force Space Command,.